It's frustrating to be overlooked. It's empowering to be heard. 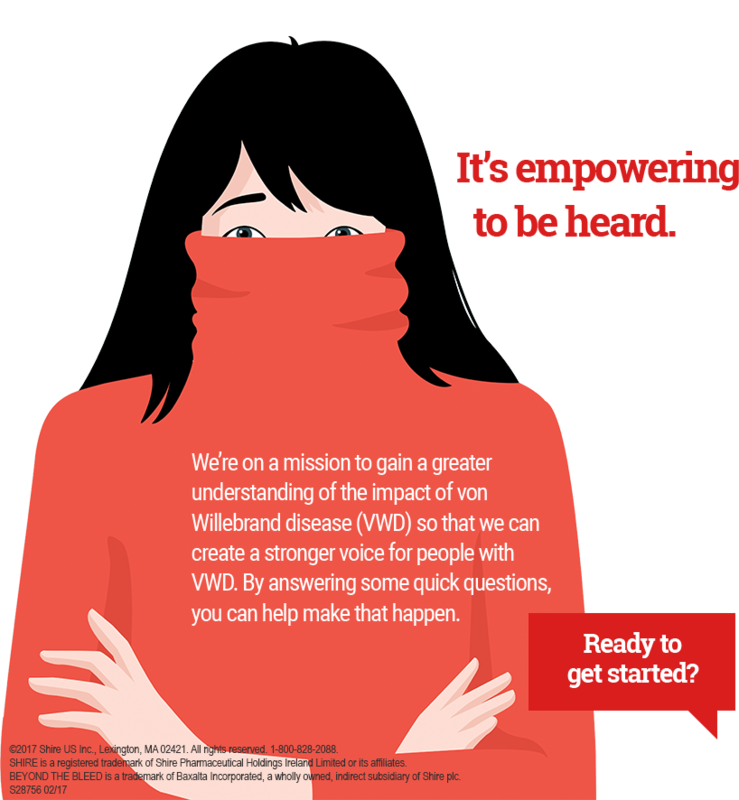 We're on a mission to gain a greater understanding of the impact of von Willebrand disease (VWD) so that we can create a stronger voice for people with VWD. By answering some quick questions, you can help make that happen. ©2017 Shire US Inc., Lexington, MA 02421. All rights reserved. 1-800-828-2088. SHIRE is a registered trademark of Shire Pharmaceutical Holdings Ireland Limited or its affiliates. BEYOND THE BLEED is a trademark of Baxalta Incorporated, a wholly owned, indirect subsidiary of Shire plc. BeyondTheBleed.com is a website exclusively dedicated to people with von Willebrand disease. Would you like to receive more information about this VWD-specific resource? We appreciate your participation. Please visit BeyondTheBleed.com to find discussion guides and resources created specifically for the VWD community.